Peaches are summer fruits but how about bringing a slice of summer to your fall and winter? We have an easy peach preserves recipe for you that could do just that. Fall has been here for about a month but you may still be in luck and find some fruity yellow peaches at the store. 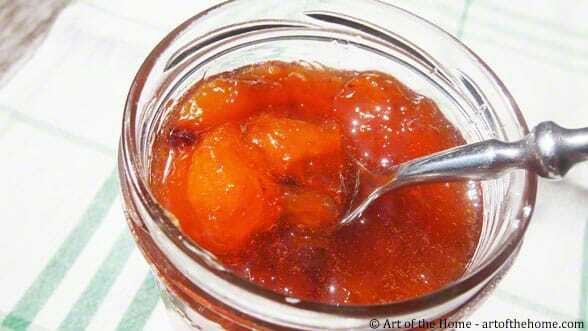 This peach preserves recipe is all fruits and very easy so why not take this last chance at making peach preserves to enjoy for the next few months. Already, earlier in the fall after we got back from France, we took out our old family peach preserves recipe and made a few jars — but not enough, they’re gone already! So imagine our joy when we found some “last tango” yellow peaches last weekend, oh joy! We do prefer to buy fruits and vegetables locally as much as we can, but we make exceptions. And those peaches come to us on the East coast from California, a long trip but still USA grown so we’re fine with that! First, we fondly got our bassine à confiture (copper jam pan, copper jam pot) out — such sweet memories! A few words on copper jam pots: if you don’t have one, that’s fine you can still make this peach preserves recipe but if you use a regular cooking pot we suggest you choose one that has the best heat transfer and with a large bottom. A copper jam pot is really a great kitchen tool to make perfect jams and preserves — and it is also a great decoration piece. You can hang it up, put it on a shelve or the top of a cabinet/armoire (where ours lives currently but it does travel and changes locations based on moods) — very rustic, gives your kitchen a touch of French country and convenient at the same time! 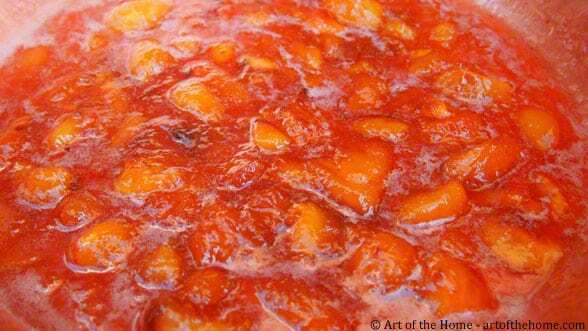 So check Art of the Home peach preserves recipe below and bring some peachy sunshine to your fall mornings. Our peach preserves recipe is 100% fruits – no pectin, no lemon just peaches and sugar! We also included Art of the Home suggestions below. Enjoy and bon appétit! 4 pounds of peeled and pitted yellow peaches (about 5 big ones). The peaches need to be nicely ripe so if needed don’t do your preserves right when you get them from the store but place them in a beautiful bowl and wait that they become soft to the touch. 3 and 1/4 pounds of sugar (about 7.5 cups) — you can adjust depending on how sweet you like your preserves and the quality of your peaches. Wash and peel your peaches. Cut each peach in 4 quarters, cut each quarter in half and place in a bowl. For bigger peaches or if you like smaller chunks of fruits, cut each quarter in half lengthwise first and then cut in half. To quarter your peaches, follow nature’s guidelines but cutting through the lines on top of the peach and slicing the peach all the way around (you will get 4 large quarters). Then with your knife, lift off the quarters to detach them from the pit. It will be juicy so to keep that precious peach juice, it is best to do this on top of the bowl where you will be saving the peach quarters. Cover with sugar. Let it macerate at room temperature overnight covered with a clean cloth. You can gently mix once or twice. Put mixture in a copper jam pot but toss the mixture beforehand because a lot of sugar will have settled at the bottom. Bring mixture to a boil over high heat. Stir with wooden spoon to dissolve the sugar. After a rapid boil of about 5 minutes, start skimming. Get as much as you can and lower heat to medium to maintain a gentle boil. Skim foam from time to time as needed. Skimming is important — if you don’t you will get crunchy crystals of sugar in your preserves. We use our Calphalon skimmer – works great for preserves and jams but for skimming homemade chicken stock as well. Cooking time varies based on the pectin level of your peaches, its ripeness and how thick you like your preserves but generally, your preserves should be ready in 1 hour. We cook ours in just less than 1 hour but you will have to judge for yourself when to stop the cooking but doing the plate test. For the plate test, using a dessert spoon, put some preserves on a small plate. Wait a couple of minutes (so it cools off) and tilt the plate. If the preserves is running, it’s not ready. If the preserve has set, then it’s ready. You will notice the preserves sticking to the plate as it very slowly goes down – that’s your sign your preserves is ready. Line a baking sheet with aluminum foil (this will make it easier to clean up afterward). 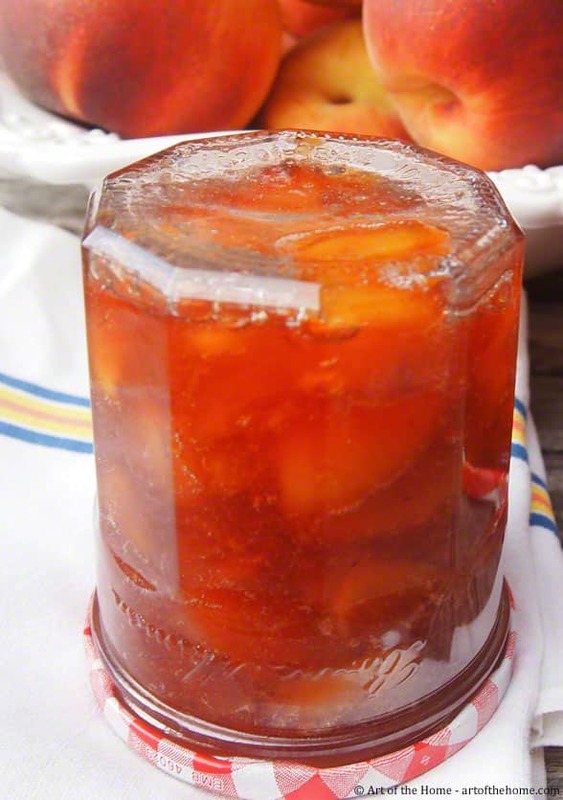 Using a ladle or serving spoon, pour peach preserves in sterilized jars. Turn the jars upside down right away to seal. And voilà! Peach Preserve Recipe Texture: this peach preserves recipe calls for leaving large chunks of fruits in the preserves (that’s how we love it – a memory of summer in each bite of peach!) but if you prefer a smoother texture, simply mix it using an immersion blender or pass it thru your food mill. Copper Jam Pot/Pan: you can find a high-quality Mauviel copper jam pan on Amazon. Mauviel is a world renowned quality copper cookware manufacturer based in the “the city of copper” Villedieu-les-Poêles in Normandy, France (lovely village near the Mont-Saint-Michel). It has been highly rated by customers too so you may want to check it out if you are interested in getting a copper jam pan to make your jams and preserves. They have 2 sizes 11 quarts and 15 quarts but we suggest the smaller one (still pretty big) which is as much as we can do in one batch anyway. This size may work for you as well and we like that it’s not a big deal to take it out even if you want to make just a few jars at a time. It is currently available with free shipping on Amazon: Mauviel Copper Jam Pan (Free Shipping). And to wrap it up, a lovely French commercial for the classic French preserves Bonne Maman. How sweet is that to leave a flower of love inside the empty Bonne Maman preserves jar — definitely melted the hearts of many mothers and grandmothers! And anybody remembers? Confitures Bonne Maman, un doux parfum d’antant – Preserves Bonne Maman, a sweet aroma from the olden days.